Anyone interested in lightweight rear brake disc? Re: Anyone interested in lightweight rear brake disc? I would have been interested if I knew it was as safe as the original and half the price. Paying £90 for a new disc isn't cheap. But if it does the same as this piss poor after market disc, then I have concerns. As for the reliability I cannot really coment other than the guy I'm working with is making small runs or one-off custom discs and sprockets for racebikes for sevaral years. He has only positive feedback and I had no such issue before as yours - but this is uncharted territory unlike the millions if mass produced oem discs what had been sold so far. Which is the same for the cost. While it is a non-profit interest of mine it would possibly not be able ro compete with mass produced parts. My current estimate is roughly 70gbp for the disc and 10 for shipping to the UK. Current cost is based on a minimum aggregated order of 5, and material of high carbon non-stainless material - which supposed ro have better friction properties and resistance to cracking surface treated ro peotect it feom corrosion on non friction surfaces. SAME OLD DIRT, SAME OLD BIKES, SAME OLD FUN. I just Love physics. My second favourite quote I usually say ro my students is that "I love physics as it is reliably fairly consistent and doesn't sleep even during weekends"
I always find new issues and questions during parting/searching/building the old school bikes. And learned that it is difficult to find people with who you can discuss why and how it 'works'. For example when building I found out that the inlet air tube from a XR250 Australia type is different from all other continents. Sorry, for going of topic! XL500s spain bike for sale.. Isn't this mostly an F=ma question? A % decrease in m results in the same % increase in a. What % of the wheel mass is removed? I suspect only a fraction of a %, therefore not much acceleration improvement. Looks like it has 1/5 the swept surface area. Not for me. Safer to have a single instead of a double cheeseburger for weight savings. This entertaining debate reminds me of a similar heated exchange on a bicycle forum about trimming weight - the conclusion is that it was a game of diminishing returns and ultimately better to lose a couple of pounds off your fat arse than weight-saving mods to a bike. Changing a rear disc brake for weight saving is so far down my wish list as to be off the scale. Still enjoy the design + thought that goes into it! Wish I hadn't seen that picture of the disc. I have just bought TWO of that brand!!! One thing about that brand is not only is it not lighter but 400grams heavier than the stock ones ( each) , despite being labeled as lighter. 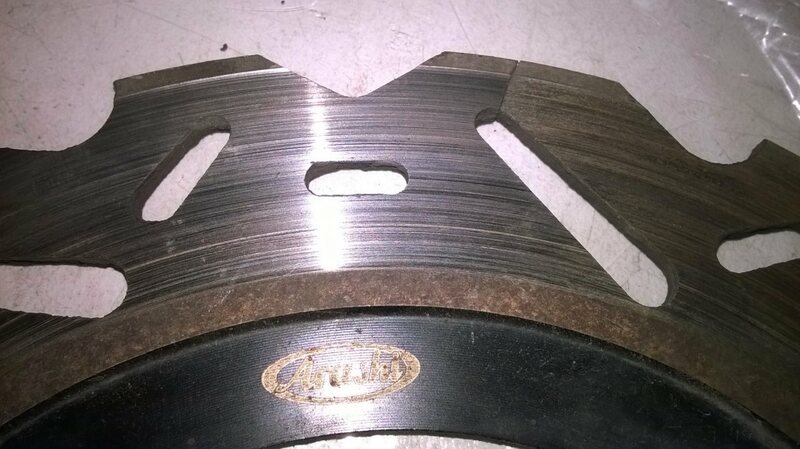 The reason is the braking surface is 20mm wider than it needs to be . This could be why it cracked. The outer part of the disc is expanding and the inner isn't, when it heats up. Mainly didn't bother because the front no centre float spider so thought wouldn't save much weight. . May have to get the brake surfaces machined down to the right width ( if it's cheap enough, one thing I cannot do myself properly) or just bit the bullet and buy EBC's. Brake design is always a balancing act between power and modulation. Changing the pad material, disc material and/or meat in the swept area all affect it. What would be better for some may not be for others. You need to know what you want from your front or rear brake before just grabbing something. That is without even factoring in the hydraulic lever ratio ( relative sizes of the master and slave pistons). BTW for those of you that don't ride mountain bikes, minimalist discs are very common and work VERY well. 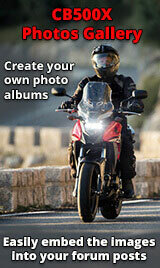 Now that doesn't mean you can do the same with a motorcycle , but MAY , depending on use. Now I have to go away and have a little lay down to get over the cracked disc pic of my expensive purchase. That's only one crack I'm showing on the disc mate, there are actually 3 and almost at the same point around the disc circumference. Only spotted it when I was washing the bike, thankfully that is almost weekly. I posted this info up some time ago. I see your point. Much more cost effective to lose the weight yourself. But, some of us a tinkerers and some of us would prefer a lighter bike. It won't happen by one single modification, but a series of small ones. This is more important than weight saving gains in my opinion. I was daft enough to buy an after market disc trying to save a few quid. It could have cost me my life if the disc disintegrated. Better to stick with OEM for items crucial to the braking system. I think I would be saying, thank f$#k I did see the picture of that disc. I wouldn't put them near your bike mate.